Los Angeles is southern California’s most populous city divided into 80 districts and neighbourhoods, many of which are communities that were merged into the city. Enjoy the best of what Los Angeles has to offer with our extensive Los Angeles travel guide to all the city’s top attractions. Take advantage of our 3 day itinerary in Los Angeles USA to help you plan your visits to all the top sites in the city. As there is so much to see and do, you may want to spend 4 days in the city rather than 3 days. Start your first day at the Los Angeles Walk of Fame Boulevard, but don't spend too much time there as we have plenty more Los Angeles attractions ahead of us. The Walk of Fame Boulevard comprises more than 2,500 brass stars in the pavements along Hollywood Boulevard. This district is a popular tourist destination and every year, it attracts up to 5 million visitors. Many tourists are disappointed when they see the Walk of Fame Boulevard for the first time because it's just a normal street and there's really nothing special about it. There are no attractive buildings, just brass stars on the pavements. However, there are some great things you can do in this street. Tip: Go up the escalator at TCL Chinese Theatre, at the very back of the building you will find terraces overlooking the city where you can easily see the Hollywood sign! The TCL Chinese Theatre is a movie palace in Hollywood Boulevard. It’s a very nice view, especially if you don’t have much time to check out the Hollywood sign later on. Also, the Walk of Fame is the cheapest place to buy some souvenirs from and the selection is huge. Another cool thing to do is to climb up the stairs at the TCL Chinese Theatre, and this time not the back of the building, but the front of the building that overlooks the street. Up on the balcony you can have an amazing view overlooking all the tourists taking photographs with stars and Walt Disney dressed characters. If you have a car, the Highlands parking lot is a good place to park your car since it’s just a few feet from the Chinese Theatre and Walk of Fame. Don’t forget to book your Hollywood bus tour tickets at the Walk of Fame before leaving. For a spot of lunch afterwards, consider dining at the famous LA restaurant, Spago. The dress code is jacket and tie for men and main courses vary from $18 to $95. In the afternoon, take the Hollywood bus tour to see the great views of Sunset Strip, Hollywood sign, and celebrity homes. This is a fully narrated tour on an open bus with canopy. When the tour is over, head to Beverly Hills, the home of celebrities. Tip: depending on your budget, there are many other cheap and personalised bus tours to choose from. But if you can afford to spend a little more, then a recommended luxury tour option is the Glitterati tour. This is a private limo tour, which picks you up from your accommodation, with no other tourists except you. The guides are very knowledgeable about LA and will take you to the most hidden and secret spots where you can enjoy the real LA without other tourists around. The guides will take you to the most beautiful sites where you can take photos of the Hollywood sign in the background without tourists spoiling your pictures. You will also find some great restaurants and bars along the way that you won't find on Lonely Planet. Such tours are highly recommended. After the tour is finished, we can head to Beverley Hills. One of the most famous and possibly the most expensive shopping streets in Beverly Hills is Rodeo Drive. It is a 4 km long street with more than 100 world-renowned shops, hotels, and restaurants. This street became famous because of the movie, Pretty Woman, with Julia Roberts who went shopping there. Even if you can’t afford to buy anything here, it is still worth window shopping and becoming lost in this area’s charm and glamour. Within close proximity to Rodeo Drive, the iconic Beverly Hills sign is a perfect landmark for taking photos of. If you go in the late afternoon, there won’t be many people around so you’ll get to enjoy the landscaped park that surrounds the sign. Another perfect Instagram photo shot opportunity is the 5-star luxury hotel, The Beverly Hills Hotel, which is on your way from Rodeo Drive. The next stop is at the Historic Greystone Mansion Park. This Tudor Revival manor house in Loma Vista Drive in Beverly Hills has distinctive English gardens and is owned by City of Beverly Hills. The grounds are usually open daily to the public from 10am to 5pm. Both parking and entry to this park are free. Another historic landmark in LA is the Farmers Market, an area full of food stalls, eateries, and food vendors. This market was opened in 1934 and is a huge tourist attraction. If you still have time left, go shopping at Melrose Avenue. This dining, entertainment, and shopping destination in LA starts at Santa Monica Boulevard and ends in Silver Lake. There are many unique boutiques and fashionable stores that you won't find anywhere else. Here you can buy a one-of-a-kind item of clothing or accessories that no-one else has. So if you are searching for the best boutiques in LA, Melrose Avenue along with Venice Beach are great options. For dinner, why not go to Craig’s in Melrose Avenue. This restaurant serves American cuisine, including steak and meatloaf. It’s also a celeb hotspot, where Sandra Bullock has her own table and the paparazzi is always there to take photos of the stars. Alternatively, you can go to Robertson Boulevard and dine at the Ivy. This is another upscale restaurant known for celebrity sightings. You won’t be able to visit both Universal Studios Hollywood and Disneyland during your 3-day visit to LA because of time pressure, but you can choose one over the other depending on your own preferences. At the Universal Studios, you will learn lots of interesting facts about how Hollywood movies are made and there are plenty of 3D rides. This is the biggest and most popular theme park in LA with the most advanced 3D rides you will have ever seen. You can even discover the world of Harry Potter. Tip: if you’re not on a budget, the Universal Studios VIP ticket experience is worth buying. You will enjoy many benefits with this ticket. For example, you will have your own expert VIP guide who will show you the park as well as the movie set, you will also have access to sound stages and warehouses, enjoy reserved seats for all the shows that take place in the park, skip the queues at every attraction, and make you feel like a celebrity. The guide will drive you around in an open air trolley to all the attractions on this park. If you are travelling with children, they may prefer to go to the magical Disneyland Resort in Anaheim instead. This theme park offers fun attractions for all the members of your family. You will love the thrilling rides and the fireworks behind the Sleeping Beauty Castle. No matter what season of the year you visit this resort, it is full of magical shows all year round. After all that fun and excitement, it’s time to see the Hollywood sign at either Runyon Canyon or Griffith Park Observatory. The Hollywood sign is especially beautiful during sunset. These sites are close to the Universal Studios so it makes sense to pay a visit as LA is always full of traffic and driving long distances is best avoided. Los Angeles Venice Beach is a must-see place and the 2nd most popular tourist attraction in LA. This beach offers visitors lots of activities, restaurants, shops, and is a surfer’s haven. Venice Beach is known for its bohemian atmosphere and is the perfect place to take a stroll in. This buzzing beach town has many high-end shops, but it’s also the perfect beach to relax on for a couple of hours. No visit to Venice Beach is complete without exploring the shops in one of the coolest and hippest Los Angeles sites: the Abbot Kinney Blvd. This boulevard is around 2 km long and all the shops are located on the stretch of Abbot Kinney. You can find anything your heart desires in any of the stores in this boulevard from handcrafts to jewellery and clothes to suit all budgets. When you’ve finished exploring the shops, head to Venice Canals, which are located very close to Venice Beach. This neighbourhood has canals, small bridges, and is the ideal place to walk around thanks to its peaceful environment. Along the canal shores, you will find many restored houses that make the perfect postcard picture. For more photo opportunities, go to the symbolic Venice sign in Winward Avenue, which has been totally restored in 2007. Afterwards, the world famous Venice Beach Boardwalk is another top attraction. This boardwalk stretches about 2.5 kilometres along the fine sands of the Pacific Ocean. On the West Los Angeles side of the boardwalk, there are numerous street performers and vendors with many unique shops and colourful murals. Here you can have your fortune read or even get a temporary tattoo! For souvenirs, this is the place to be as there are lots of unique arts and crafts for sale. Venice Beach is certainly the perfect place to bring your 3-day stay in LA to an end. To explore this beach, you can rent a scooter by downloading the Bird or Lime app and unlocking the scooter using the barcode from the app. You will then be able to ride around the beach and enjoy yourself. Riding on a scooter is so much fun, especially if you get tired of walking. The best way to enjoy the scooter is to ride along the beach sidewalk after you get tired of walking through Abbot Kinney Boulevard. Runyon Canyon is located right in the middle of Hollywood and a great place to spot celebrities or see the Hollywood sign. Its location is only about 2 km from the famous Hollywood Boulevard. This hidden gem hasn’t been fully discovered by tourists yet, perhaps because they just don’t want to climb the mountains to reach the top. The canyon's trail is nevertheless fun and a must-do if you have time during your trip to LA. 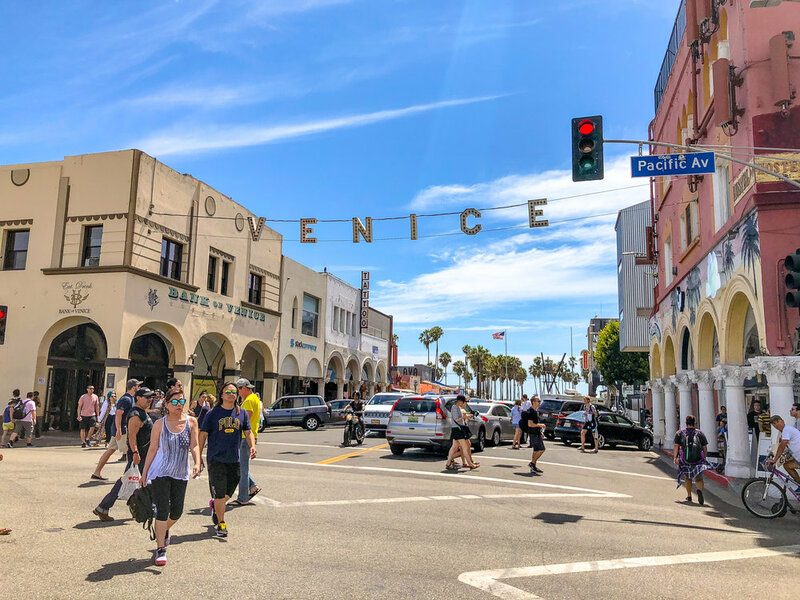 From its well-known boardwalk and stunning beach to the shops in Abbot Kinney Boulevard, Venice Beach offers a one-of-a-kind and vibrant mix of attractions and activities to people of all ages. This destination’s original name was Venice of America and founded in 1905 by Abbot Kinney. It soon became an upscale beachfront resort and a mecca to accommodate the public and tourists. Venice has become an amusement pier with canals and imported gondolas that replicate Venice in Italy. When you take a walk along Venice Beach, you will realise what a popular destination this LA beach is for visitors and locals. It is still highly sought by famous artists and poets who continue regarding this site as an important LA cultural centre. If you’re looking for a unique shopping experience, some relaxing time on the beach, or an evening full of music and art programs, then this is the neighbourhood to come to. 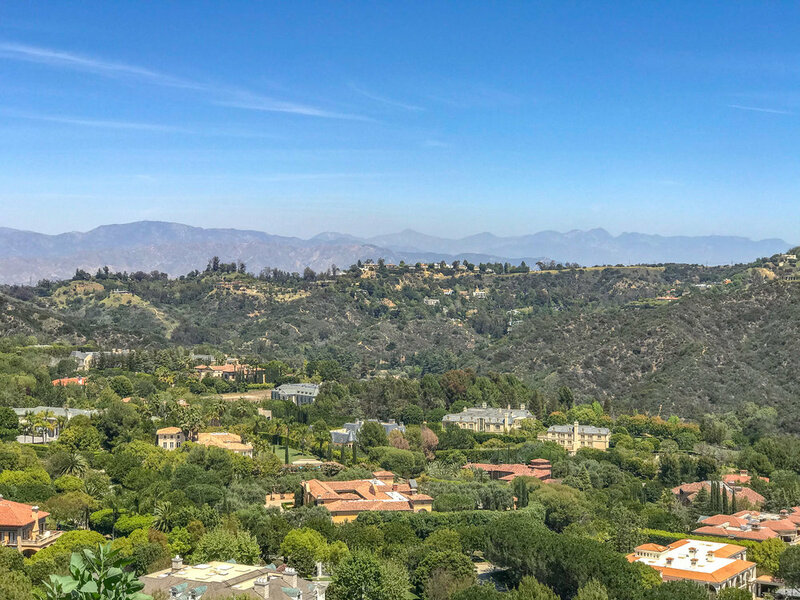 Griffith Park is the largest municipal park in LA with 4,210 acres of canyons and mountains on the eastern edge of the Santa Monica Mountains. 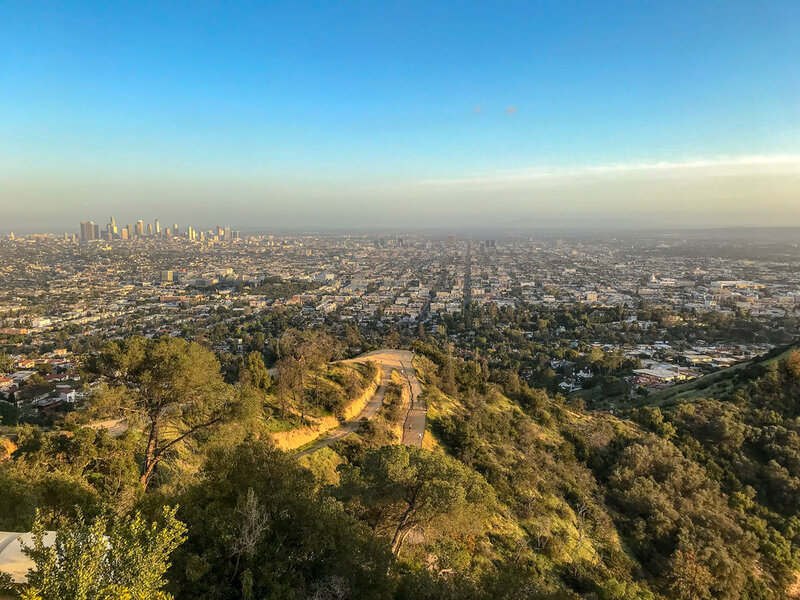 The amazing stretch of rugged hilly wilderness in a huge urban area boasts 80 km of trails including the park’s highest mountain point, Mount Hollywood. If you are travelling to LA and have a car or taking a tour bus, the Griffith Park Observatory is a must-see place. It offers a stunning view of the Hollywood sign from the hills. You can reach the top of the hills by walking and see the sign for free. It’s also possible to see all the walking trails Hollywood offers by exploring the site on foot. If you love hiking, put on your comfy shoes and go on one of the popular trails or ride a bike for a couple of hours through this park. Little Tokyo is a historic landmark district around 3 km from LA city centre. It offers a wide variety of cultural, shopping, gastronomy, and historical sites to give you a taste of Tokyo. Little Tokyo is one of the three official Los Angeles Japantown destinations with over 30,000 Japanese residents in the district. Take a stroll along this popular district and get a feel for its history and culture. Santa Monica Beach is located west of downtown and is a symbolic example of the famous Southern Californian beaches. Aside from Venice Beach, Santa Monica Beach also offers large expanses of cycling paths and activities. 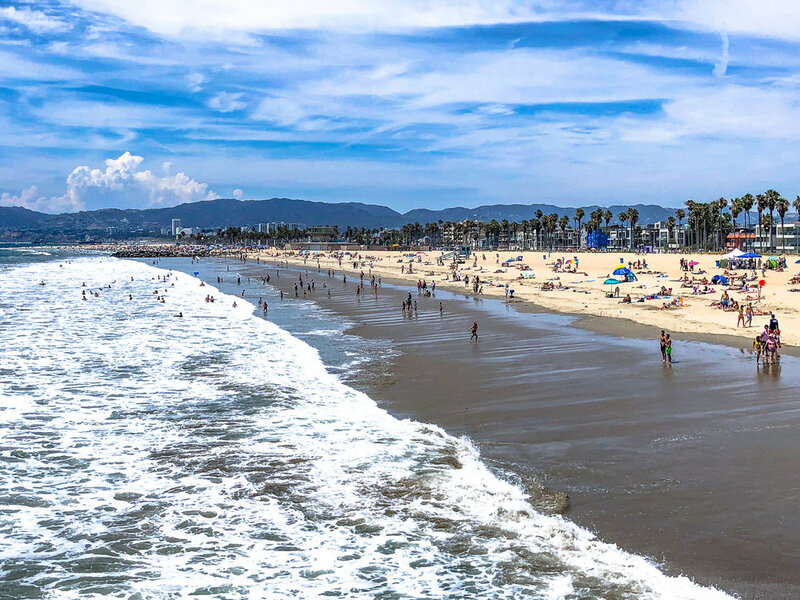 You can find an amusement park, lots of restaurants, a pier, and an aquarium right in the middle of the beach, from Colorado Boulevard to the Santa Monica Pier. If we compare this beach to Venice Beach, we must say that Venice is much nicer with trendy restaurants that serve organic foods. The restaurants in Santa Monica Beach, on the other hand, are nothing to rave about. However, this beach does have good shopping possibilities, but not quite the uniqueness of the boutiques on Venice Beach as they are chain stores. What’s more, the pier looks outdated and the foods at the restaurants like Bubba Gump are overpriced. This very famous and perhaps overrated sidewalk along Hollywood Boulevard in California is more like an entertainment museum with thousands of handprints and five-pointed brass stars with the celebrities’ names embedded on them. Some of these stars are actually fictional characters like Batman and Superman. Nearby, visit the iconic TCL Chinese Theatre, a huge movie palace with stadium-like seating. Before going to the auditorium, pay a visit to the museum, which gives you a better idea of the theatre’s history as told by the very helpful staff there. Malibu’s Zuma Beach is one of the biggest and most popular Los Angeles beaches. This county beach is located in Pacific Coast Highway and known for its wide and long sandy shores, which are excellent for surfers. Zuma Beach is ranked high for its clean water conditions. A visit to this LA beach is a must, especially for water sport lovers. Your trip to LA isn’t complete until you catch a movie at Cinespia. This is an ultimate summer experience with lots of booze, snacks, picnic blankets, and folding chairs at one of the best film venues in the US. Just make sure you buy your ticket in advance and get there early. Doors will open from 6.45pm and the place can get overcrowded soon after so get there as early as you can. This small café was opened in 2016 and fosters rescue cats. It provides all types of amenities for customers as well as for the cats. The rescued cats were either saved from euthanasia or were homeless on the streets. When you visit this establishment, you can grab a cup of coffee and stroke a cat or even make a donation. One of the cafés is located in the LA metropolitan area and the other is in Washington DC. Disneyland is located in the Los Angeles area of Anaheim just 30 minutes southeast of the city. It is a popular attraction for families with young children. There are two parks in the Disneyland area called Disneyland Park and California Adventure Park. Here you can enjoy lots of themed rides that are great for thrill seekers. Both of these Disneyland parks are well worth a visit, no matter what age you are. This is a famous public attraction situated inside Warner Brothers Studios close to Hollywood. The Warner Bros. tours offer visitors the chance to take a peek at behind the scenes of one of the most popular studios in the world. It’s a 3.5 hour tour that shows you how movies are produced, from auditions to the actual production, the post editing process and music. A must-do tour for anyone who loves Hollywood films. Paramount Pictures is a film studio based in Hollywood, CA, and the 5th oldest surviving film studio in the world. If you want to take a studio tour around this historic site, you’ll be pleased to know that there are tours offered 7 days a week. You must book in advance by visiting the website here. Now for the ultimate Hollywood experience and a whole day of action-packed entertainment, all you need to do is visit the Universal Studios. There are exciting theme park rides, shows, shops, restaurants, cinemas, and a real movie studio all in one place. Universal Studios is a truly unique experience for couples and families alike. You can take one of the many tours through the studios before going on roller coaster rides and taking part in attractions that place you inside the most famous Hollywood movie scenes. Rodeo Drive is well known for its luxury boutiques that require customers to make an appointment before entering. This is a 4km long street that is mainly in Beverley Hills. Tiffany’s is one of the most famous boutiques on Rodeo Drive, but there are lots more. Even if you can’t afford to buy anything here, it’s still worth window shopping and taking photos. The Getty Centre was opened to the public back in 1997 and is well known for its unique architecture, amazing gardens, and the breathtaking views across LA. The $1.3 billion centre is a museum with numerous outdoor sculptures that are displayed on its terraces and gardens. If you like museums and architecture, then you will love visiting this iconic site. The historic Greystone Mansion has 55 rooms in Tudor-style décor with 16 acres of land. This mansion and its park are owned by the Beverly Hills City and it cost around $4 million. Greystone Mansion was the most expensive property that was built in California at that time. You can book tickets to see inside the mansion or attend the open-house days and musical shows on selected evenings. It is also possible to arrange a private tour to explore inside the mansion, where the movies Spiderman and the Muppets were filmed. This cemetery is one of the oldest graveyards in Los Angeles, located at Santa Monica Boulevard in the Hollywood district of LA. It’s the final resting place of celebrities and there are many events that take place here during the summer months. See this website for a list of all the events. This is the largest art museum in the entire western region of the US. The museum attracts over a million visitors annually and is home to more than 100,000 artworks featuring history of art from the past to the present. The museum also features many concerts and film programs in addition to art exhibits. Dolby Theatre is an auditorium in the entertainment complex at Highland Centre mall of Hollywood. This theatre’s stage is one of the largest in the US with capacity to seat 3,332 people. It has been hosting America's Got Talent every year for the last 2 years and there are many guided VIP tours offered daily. Its opening hours are from Monday to Saturday 10am–5pm and on Sunday 10am–4pm. This oceanfront amusement park is situated in California’s Santa Monica district. The park is located on the pier of Santa Monica Beach and looks directly out on the ocean. It’s non-gated and entry is free, but you will need to pay for the rides. There are also lots of food outlets, shops, and a seaside pavilion event to enjoy. This is a Los Angeles public library with a huge collection of educational and research-based resources in San Marino. In addition to the library, it is also home to a large European art collection from the 18th and 19th centuries as well as American art from the 17th to 20th centuries. There is a beautiful landscaped 120-acre botanical garden on this property divided into three themes: the Japanese Garden, the Chinese Garden, and the Desert Garden. The Grove is an entertainment and retail complex in LA, California. It is located at the Farmers Market and features a huge park with an elaborately designed fountain. Every hour, you can watch the music-fountain show as well as non-musical shows. This zoo and its botanical gardens is on 133 acres of land opened in 1966. It is home to more than 1000 mammals, reptiles from 250 different species, amphibians, and birds. At the botanical garden of this zoo, there are over 700 different plant species with 7,300 individual plants. Aquarium of the Pacific in Long Beach is the world’s largest underwater exhibition with over 1.5 million visitors a year. This huge aquarium has a collection of over 10,000 mammals from 500 different species. The Pacific Ocean is the main focus of the three major galleries. Here you can learn all about the Tropical Pacific and the colourful reefs of the Northern Pacific. Visiting the aquarium will certainly be an educational and inspirational trip for people of all ages. Sunset Plaza has been a shopper’s paradise for over 90 years. It is the perfect place to spend an afternoon shopping in many of its boutiques or enjoying a meal al fresco. There are currently over 40 designer shops, spas, and restaurants in Sunset Plaza. 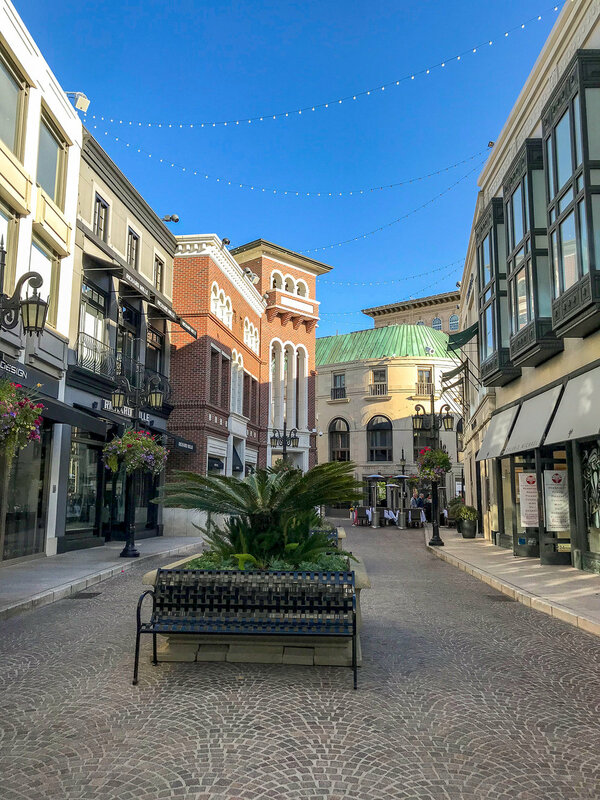 The locals and visitors take a break from all the hectic traffic and come to one of the most sought-after areas of LA for a spot of shopping and dining. It’s a great place for a lazy afternoon of people watching. Located in the east of Santa Monica Mountains in California, Mulholland Drive is named after the iconic civil engineer, William Mulholland. You can drive along the top of the hills through this 34 km long street and enjoy the stunning views of LA as well as the Hollywood sign and San Fernando Valley. This museum is located on Wilshire Boulevard and features over 100 unique and collectible vehicles in its 20 galleries. Some of the highlights include motorcycles, racing cars, hot rods, and customised vehicles. On the third floor, you can get an insight into the car culture of Southern California and learn about the history of the automobile. If you’re into classic cars and bikes, then this is the museum to visit. The Writers Guild of America is a writers union comprising thousands of writers who write scripts for movies, TV shows, press releases, video games, and documentaries. You can also visit the free library of the Writers Guild on Third Street, LA. The venue allows you to rent an iPad and read the script of every show or movie. LA has some of the best comedy shows in the country. You can watch your favourite standup comedians at Hollywood’s Laugh Factory. The other great venue is the Comedy Store in West Hollywood’s Sunset Boulevard. Choose either the Comedy Store or the Laugh Factory to catch an evening show during your 3-day visit in LA. This is a popular hang-out in the summer even though it’s a creepy place to go to. There are also music and film productions as well as many summer events going on at this cemetery. If you aren’t lucky enough to spot a celebrity during your 3-day visit to LA, you’re guaranteed to see them (the dead ones anyway) in this cemetery. Opened in 1999, this restaurant welcomes guests from all over the world to enjoy its home-style food and down-to-earth hospitality. But before you have dinner there, treat yourself to a ride on a mechanical bull first for a truly western experience. World-class performers get together in outdoor concerts on summer evenings. You can enjoy a great outdoor concert at the Hollywood Bowl’s amphitheatre under the stars. What a perfect way to end the evening! This venue is LA’s iconic landmark and was opened in 2003. It is located on Grand Avenue in downtown LA. Every year, this venue hosts over 250 concerts for visitors to enjoy. This concert hall is the most acoustically advanced and sophisticated in the world. With high-tech facilities and advanced sophistication, this LA venue is the ultimate movie experience. You have never seen a bigger IMAX screen than this one. The cinema is located inside the state of the art CityWalk Hollywood. The AMC movie theatre is another great venue to watch your favourite film, with high-end facilities on offer at Universal City Plaza, CA. This 15-screen multiplex cinema and stadium at Sunset Boulevard was opened in 2002 and has a certificate for its optimal sound and picture quality. You can visit the cinema that's located inside the dome or enjoy a snack in its excellent café restaurant before or after the movie. It also has a small gift shop in the lobby. On this day trip, you can explore the 1,000 acre ranch and vineyard in Malibu. Your knowledgeable guide and driver will take you to Saddlerock Ranch on a custom-built safari vehicle. You will be able to enjoy the scenery, sample the local wines, get up close and personal with zebras, giraffes, camels, and alpacas, and all these just 30 minutes from LA! This day trip offers a piece of California history in a small charming town of San Juan Capistrano. You can take the train (Amtrak) to this town and enjoy a nice cup of coffee at Hummingbird House Café. Once you’re in San Juan Capistrano, take the tour called Mission San Juan Capistrano, which is known as a swallow migratory destination. On this 2-hour tour, you will discover Hollywood’s first ever movie studio and visit the iconic locations that have appeared in famous movies. Your guide will also explain about the 105-year Hollywood legacy that influenced the world at large. The Paramount Studio Tour will take you back to where it all started so brace yourself for an informative and interesting trip to this historic film studio. Big Bear Lake is located in a national forest on the San Bernardino Mountains. Big Bear is a small town and an excellent place to take part in outdoor activities. The 14km long Big Bear Lake has plenty of fish and allows you to enjoy jet skiing, rope climbing, and paddle boarding. Another one of the Los Angeles sites to visit has to be the Angeles National Park. The hikes to the Devil Punchbowl and the Bridge to Nowhere are some of the best in the region. This national forest is almost 30 minutes from downtown LA, on the north of Pasadena. The Angeles National Forest is an urban jungle with rocky canyons and a summit of over 10,000 foot Mount Baldy. This site is a hiker’s haven and it’s perfect for mountain biking and camping. Gracias Madre: it has a wonderful selection of vegan Mexican food. Craig’s: American cuisine, including steak and meatloaf in a private and cosy venue known for celeb sightings. Sandra Bullock has her own table and the paparazzi is always there to take photos of celebs. Cecconi’s Italian restaurant: here you can enjoy the full LA experience in West Hollywood’s most authentic Italian restaurant with delicious cuisine and great ambiance. Catch: a very popular rooftop restaurant, possibly the best one out of them all. This slick restaurant is located above the bustling streets of West Hollywood on the corner of San Vicente and Melrose. It is known for celebrity sightings and the most creative seafood and cocktails. Ago: this is Robert De Niro’s restaurant in Melrose Avenue. It is an elegant eatery with a patio, serving Tuscan cuisine. Crossroads: an upscale eatery that provides an elegant backdrop for delicious vegan dishes served with wines and cocktails. Spago: located in the heart of Beverly Hills, this famous American restaurant offers creative and locally sourced food. Rooftop Waldorf Astoria: with a variety of different flavours from Latin America and Southeast Asia, this eatery offers small plates that can be shared plus vegan specialties. Eveleigh on Sunset Strip: this restaurant offers seasonal, local-farm food menu that takes its inspiration from European and American cooking. Pink's Hot Dogs: creatively topped hot dogs served at a historic roadside spot. There is always a long queue as everyone wants to grab a Pink's hot dog. This establishment has been around since 1939. The Ivy: this upper class restaurant serves Californian cuisine and is located on Robertson Boulevard, LA. It's a great place to spot celebrities. You will also find lots of restaurants in Sunset Plaza West Hollywood. Supreme: this sneaker store is very popular for skating and punk fans who are looking for urban apparel. Los Angeles flea market (Melrose Trading Post): this huge flea market is on the campus of Fairfax High School and open every Sunday from 9am to 5pm. It is a community-based nonprofit organisation offering handcraft goods, vintage fashion, unique treasures, and antique furniture. Admission is $3. Melrose Avenue: this is a very famous shopping avenue with a wide range of shoe shops, restaurants, and clothing stores. The television series Melrose Place made this avenue famous. You will find many chic boutiques and bars in this destination. Melrose Avenue starts at Santa Monica Boulevard and ends at Lucille Ave. in Silver Lake. Venice Beach: there is a wide assortment of unique shops on Venice Beach, from upscale boutiques to the coolest streetwear. You can find many unique items here that you won’t find anywhere else! Westfield Century City: this outdoor mall is located in the commercial district of LA and is on two levels comprising of 1.3 million square foot. You will find all the best known stores as well as numerous eateries in this mall. The Los Angeles traffic is horrendous: you need to plan where and when you want to go well in advance. It’s best to visit the attractions that are located close to each other. For example, longer tours like Malibu should only be done on weekends due to less traffic. Google map times are incorrect and take up twice as long when you are stuck in traffic. If you intend to only visit the city of Los Angeles and won’t be doing a road trip, then don't take a car. Car rental companies at the airport are too far and it would take too long to get there as you will have to catch the bus plus parking is expensive everywhere. It is probably cheaper to use Uber or Lyft. However, nothing beats the driving experience through LA in a cabriolet. If you are going on a road-trip, then you’ll definitely need a car anyway. Even though California is always sunny, it does not mean it is always warm. Don't make the mistake of thinking that is can't get cold as sometimes the winds can be very chilly so make sure that you pack a jacket in your bag. Go on the VIP Tour at the Universal Studios. This tour allows you to skip the queues and get much more information as well as access to sound stages. The studios like Universal, and Warner Brothers are very interesting, but if you are under time pressure and not able to explore them all, I would recommend the Universal Studios tour as it is the biggest one available. Shopping hacks? Shops along the Abbot Kinney Blvd in Venice, CA, are quite nice as well as shops in Melrose Ave. Here you can find very unique items. Of course the huge shopping centres do offer a lot, but you can find these chain stores everywhere. Find your one-of-a-kind item of clothing in a nice local boutique rather than the mall. Spend a day on Venice Beach. In my opinion it is much more worthwhile than spending a day in Santa Monica. The pier in Santa Monica looks outdated and the restaurants near the pier are poor quality and overpriced. What’s more, the tourist shops are rip offs, too. The beach in Venice Beach is quite nice and the shops are much better than in Santa Monica. On Venice Beach you can find unique boutiques rather than chain stores that exist in Santa Monica. 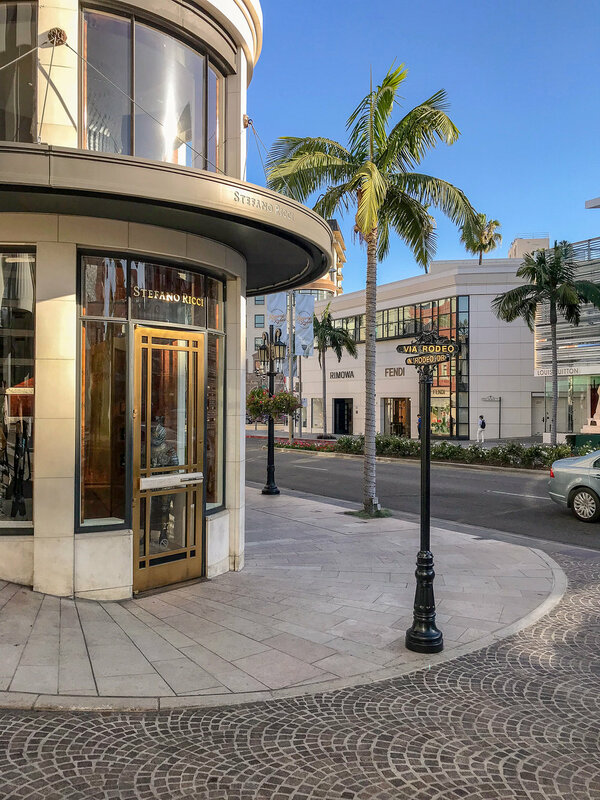 Even though you will probably not afford to buy anything at Rodeo Drive, it's still worth going there for some window shopping. 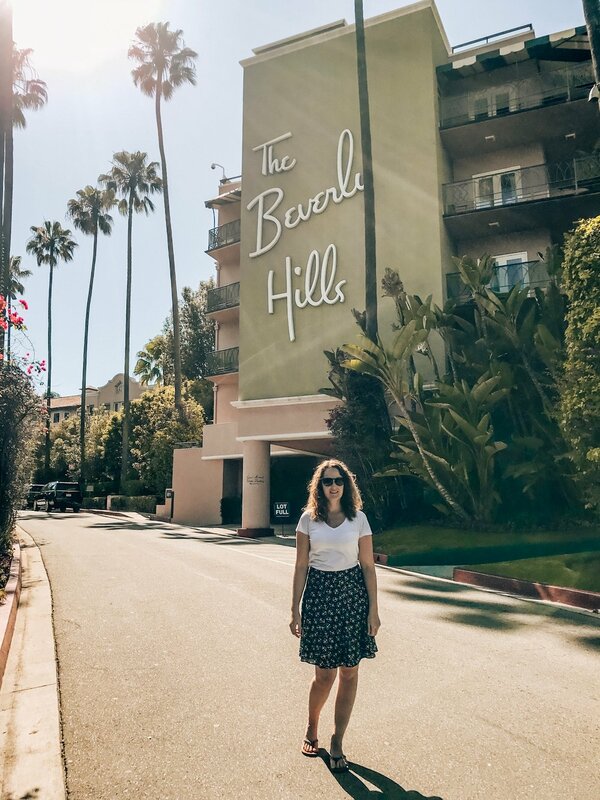 Whilst you are in Beverly Hills, check out the Beverly Hills sign and get your Instagram shots in front of the famous Beverly Hills Hotel. Most tourists are disappointed when they see the ever-so famous Hollywood Boulevard for the first time. That's probably because they imagined the Hollywood Walk of Fame to be more glamorous, when in reality it's just a normal street. However, there are some good things to know about this boulevard. For example, most people don't know that they can see the Hollywood sign from the Walk of fame district too! And it's the best place in the city to buy some tourist souvenirs from. There are plenty of souvenir shops with reasonable prices. Hollywood sign: most tourists make the mistake of only going to the Griffith Park Observatory or to the Runyon Canyon. Both sites are good, and the Observatory offers great views over the city too - but they are overcrowded with fellow travellers. Yes, you should go to Runyon Canyon, but you should stop at a different spot! That's the key. To have the Hollywood sign all for yourself as we did, checkout this map. You can also download the map from our website, link in the description. Getting around: download either the Bird app, or the Lime app and hop on a scooter whenever you need to take a trip to LA. Those scooters are especially popular on the beaches, such as Venice Beach and Santa Monica. Alternatively, you can also explore Los Angeles by bike with Metro bike or use any other bike rental company. However, the quickest and definitely the most fun way is with a scooter. Where is Los Angeles located on the map? LA is located in the city of California at 34.05 latitude and 96 metres above sea level. How far is Los Angeles Airport from LA? LAX is 40 minutes away from LA city centre. What are the biggest airports around Los Angeles called? LAX is located West of LA and is one of the busiest airports in the US. The 2nd biggest airport is Ontario International Airport, which is East of LA. The 3rd one is John Wayne Airport in the Northern region of Orange County. Which state is Los Angeles in? Where is the Los Angeles Dodgers Stadium? This famous baseball stadium is located in LA's Elysian Park neighbourhood. Where is the Los Angeles Convention Centre? It is located in the Southwest of downtown Los Angeles. What are the Los Angeles Zoo hours? The zoo is open from 10am to 5pm and is located at Number 5333 Zoo Drive. LA. Where is the Los Angeles Greyhound Station located? It is located at 1716 E 7th Street, LA, California. Has LA ever been hit by hurricane? There have been two tropical storms that have hit Los Angeles Cali since 1900. Has Los Angeles ever experienced natural disasters? LA County has experienced all kinds of natural disasters from floods to earthquakes and wildfires. In fact, Southern California is currently experiencing a series of huge wildfires. Which Los Angeles international airport is closest to down town Los Angeles? Hollywood Burbank Airport is around 33 km from downtown Los Angeles. Which Los Angeles neighbourhoods are the most popular with visitors? The most popular neighbourhoods in LA for visitors include the Hollywood Hills facing downtown LA and Santa Monica. The views of the ocean are incredible here. Hollywood Hills East is another enclave with a small village called Beachwood. This is a great for sightseers and hikers to explore. Further on, nearby attractions like Griffith Park and the Los Angeles Observatory are within easy reach and a big draw for tourists. This is where you can see the Hollywood sign up close. Another popular attraction is Venice Beach. This area is not only one of the best places to live in LA, but it’s also the best beach in town with lots of activities to take part in. What is the Los Angeles time zone? What is the Los Angeles population? How many beaches does Los Angeles have? Los Angeles has no access to the ocean, but it does have at least 15 beaches in the entire county if you include the Orange County beaches in the South and North. Which LA beach is the best? The best Los Angeles beach has to be Venice Beach. This beach receives millions of visitors every year and is known for its bohemian atmosphere. The boardwalk has many unique attractions, such as paddle tennis courts, skating courts, and many other sports grounds. There are also plenty of restaurants and very interesting shops on Venice Beach so you'll never get bored. What is LA famous for? LA holds many distinctions since it’s the entertainment capital of the world. With more than 100 museums and year-round sunshine, it’s no wonder so many tourists choose this destination. The city is famous for many attractions like the Walk of Fame with more than 2,614 brass stars. In fact, some of the world’s most iconic landmarks are in LA, from the TCL Chinese Theatre, the Getty Centre, and Universal Studios, to Rodeo Drive, the Griffith Observatory, and Dolby Theatre. The residents of LA speak more than 224 different languages and are from 140 countries. No other city in the world has such diverse and dynamic culture as Los Angeles. Refer to our list of LA attractions. The colonial Mexican town was discovered by Mexican families in 1848 and established settlement in Southern California when this state became part of the US. How did LA get its name? Los Angeles is a Spanish word meaning the Angels. It is an abbreviation of the Los Angeles full name ‘El Pueblo de Nuestra Señora la Reina de los Ángeles del Río Porciúncula", which means ‘Town of our lady the Queen of Angels of Porciúncula River’. Los Angeles has several names or nicknames. It is also called the City of Angels because of its literal meaning the Angels. Another name for LA is the City of Flowers and Sunshine because of its warm, sunny weather. How to get around Los Angeles? Take a public bus, Uber, or the subway whenever possible, but due to heavy traffic, you can hire a bike or scooter instead. What is Los Angeles weather like throughout the year? The climate in LA is a year-round mild-to-hot type of climate. Throughout the months of spring the weather is mild, but in sharp contrast, the Los Angeles July weather is hot just like the rest of summer. The Los Angeles June weather and Los Angeles weather in August are hot and humid. July is the hottest month in Los Angeles with an average temperature of 28 degrees Celsius. Los Angeles October weather is cooler and more comfortable with the average temperature of 18 degrees Celsius. The wettest month in LA is January with an average of 79mm of rain. How is the weather in LA during December? Just like November, Los Angeles in December weather is one of the coolest months with an average temperature of 14 degrees Celsius. However, it does rain a lot during the month. San Francisco is around 6 hours away from LA. The distance is approx. 720 km. How far is Hollywood from LA? Hollywood is one of LA's neighbourhoods situated 12 km away from the city centre. What is the distance from Los Angeles to Las Vegas? How far is New York from Los Angeles? When was the Los Angeles Olympics? 1932 and 1984. The next one will be in 2028. When is the Los Angeles marathon? 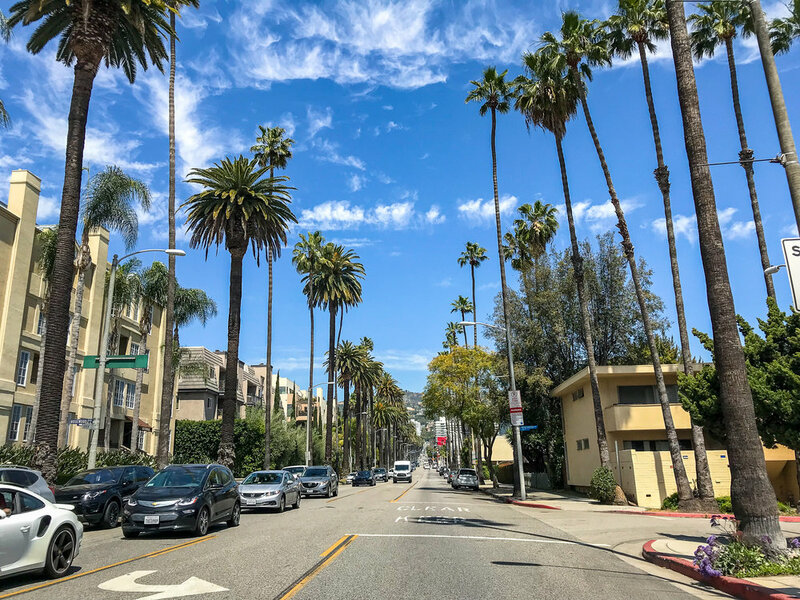 The best times to visit Los Angeles are from early spring (March) to May and in autumn from September to November when the weather is cooler and the heatwave has passed. Average temperatures during these months are from 18 degrees Celsius to 22 degrees Celsius. This makes walking around town and visiting the attractions much more comfortable. If you want to get the best deals, book your Los Angeles trip for winter (January or February). You will find accommodations and flights cheaper during these months. Just don’t forget to pack an umbrella in case it rains. Los Angeles weather in July is hot and most tourists come to LA during this time because of the holiday season. However, prices are much higher and all the attractions get very crowded. It’s best to avoid LA during summer and book your flight for the off-peak season instead. How many shopping malls are in LA? There are at least 200 shopping malls in California with 21 of them located in LA. Which hotels are near LAX? See this list of the best hotels near the airport. Can I explore LA without a car? If you want to visit Los Angeles without a car, there are plenty of sites you can reach on foot, as long as you stay in a hotel that’s within easy access to local attractions. For example, Hollywood gives you easy access to Universal Studios and downtown plus you can always use public transportation to visit the vicinity and beyond. It’s best to stay in a Hollywood hotel if you don’t have a car or you can visit all the sites via Los Angeles metro. Is Los Angeles child friendly? 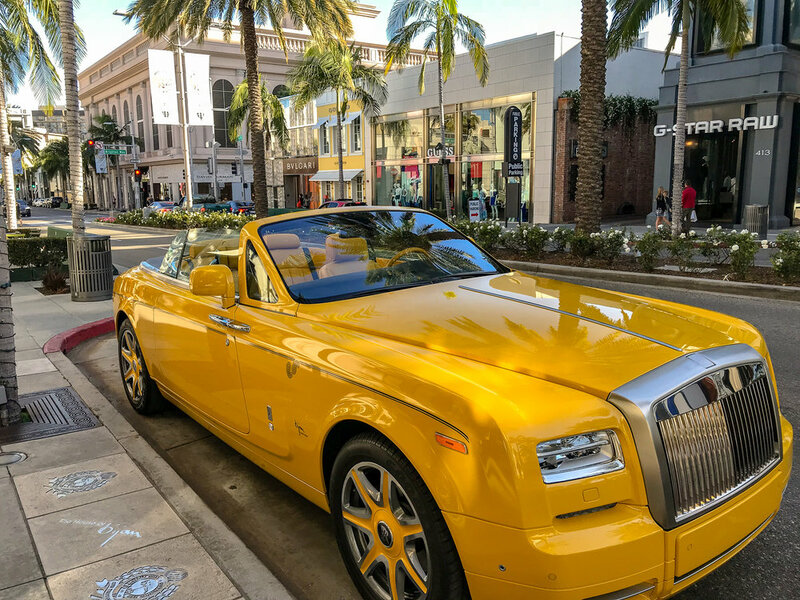 When you take a walk around Rodeo Drive or the Sunset Strip, you might get the impression that this city is not exactly a great place for the little ones, but in reality, there are numerous child-friendly attractions, from the zoo and interactive museums to the aquarium and theme parks. LA is a great city to explore with the little ones since it’s close to Disneyland and Universal Studios in Burbank. Kids will also enjoy many free or low-cost activities that will keep them occupied all day. Is Los Angeles pet friendly? Yes, there are plenty of pet-friendly hotels, beaches, parks, and restaurants in LA so you can enjoy your trip without having to leave your pet at home. Where are the closest camping grounds to LA? Camping sites are quite scarce in LA, but you will find a couple of places that are worth mentioning. The campgrounds in Malibu Beach RV Park comprise 100 sites for both tents and RVs. Point Mugu State Park is another picturesque park along the ocean, which is also suitable for tent and RV camping. The rest of the camping grounds are along the beach and in Sycamore Canyon. How to reach Los Angeles from London, UK? Take a non-stop flight from Heathrow to LAX. The duration of the flight is around 10 hours. Is there a Los Angeles to San Francisco train? Yes. Amtrak’s Coast Starlight provides a scenic ride along the Pacific coast with up to 34 trains per day. 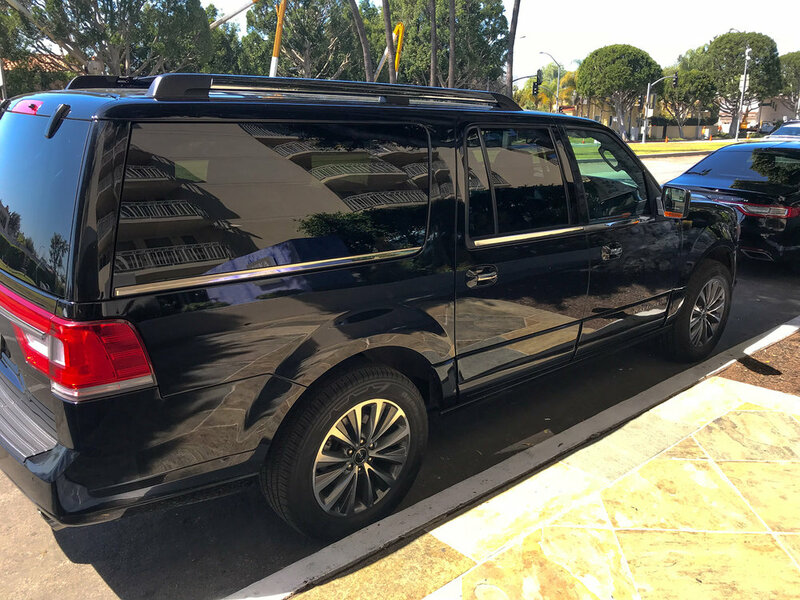 When you are looking for the most suitable Los Angeles accommodation, you must try to stay central so that you won’t have to travel too far to each attraction you want to visit. Keep in mind that the traffic in LA is a nightmare and you’ll want to avoid driving long distances at all cost. After all, it will take too much of your time to reach all the sites. Downtown is another good place to stay in since it’s within easy reach to Hollywood and the Los Angeles hotels in this area are the most reasonably priced. This part of LA has a great nightlife and some of the best restaurants. For those who want to be close to the Walk of Fame and Universal Studios, Hollywood is the most convenient place to stay in. There is no need to rely on public transportation or rent a car as everything is walkable. Similarly, West Hollywood’s hotels along Sunset Blvd are central and within easy reach of all the top attractions.